In 1508, Pope Julius II commissioned Michelangelo to paint the ceiling of the Sistine Chapel. He had been strongly advised against doing so. At 12,000 square feet, the ceiling represented one of the largest such projects ever attempted; and the thirty-three-year-old Michelangelo had very little experience of the physically and technically taxing art of fresco. Indeed, Michelangelo himself was reluctant, considering himself a sculptor rather than a painter. Nevertheless, for the next four years he and a hand-picked team of assistants laboured over the vast ceiling, making thousands of drawings and spending back-breaking hours on a scaffold fifty feet above the floor. The result was one of the greatest masterpieces of all time. 'There is no other work to compare with this for excellence, nor could there be,' wrote Vasari in his Lives of Artists. Ross King's fascinating new book tells the story of those four extraordinary years, Battling against ill health, financial difficulties, domestic problems and inadequate knowledge of the art of fresco, Michelangelo created figures so beautiful that, when they were unveiled in 1512, they stunned onlookers, Working with brushes made from hogs' bristles and pigments manufactured by monks in Florence, he and his assistants painted nudes in such detail that modern anatomy has yet to find names for some of their muscles. 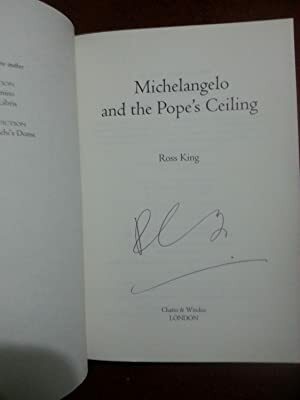 From Michelangelo's ground-breaking studies of the human form to his bitter rivalry with Raphael, who was frescoing the neighbouring Papal Apartments, Ross King paints a magnificent picture of day-to-day life on the Sistine scaffolding - and outside, in the upheaval of early sixteenth-century Rome. Ross King was born in Canada in 1962 and completed a PhD in English Literature at York University in Toronto. He is the author of two novels and <i>Brunelleschi&#x2019;s Dome</i>, (voted Non-Fiction Book of the Year by American Independent Booksellers in 2001). He lives in Oxford.